On March 1, 2016 Bill Kempster passed away at Ayre Manor at the age of 98. While is death was not remarkable, his contributions to the South Vancouver Island gardening community were. Bill immigrated to Victoria shortly after WWII, bringing with him a love of outdoor activity – hunting, fishing, exploring, and gardening – and an unstoppable drive to be busy and productive. He pursued all of these hobbies for decades, but was through is passion for growing plants that most people came to know him. Long-time dahlia growers all over the Island knew Bill well. 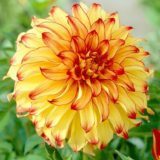 In the early 1950s, he began hybridizing and exhibiting dahlias through the Pacific Northwest and, in the late 1960s, was instrumental in convincing the Victoria Gladiolus and Dahlia Society to join the Pacific Northwest Dahlia Conference. 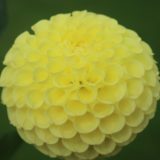 To this day the (renamed) Victoria Dahlia Society remains an active member of the PNDConference, which oversees the training and certification of judges and the classification of blooms that present differently (e.g. in form, size, or colour) in our climate. Some years later, Bill installed a dahlia garden at the Horticulture Centre of the Pacific. That garden subsequently became the Victoria Dahlia Trial Garden, a sanctioned seedling garden of the American Dahlia Society. Envisioning a local world-class botanical garden and site for hands-on horticultural training, Bill co-founded the Horticulture Centre of the Pacific in 1979, now home to numerous gardens as well as the accredited Pacific Horticulture College. The Kempster Building acknowledges his enormous contributions as board member and president, labourer and builder, student educator, and volunteer mentor. Bill’s lengthy involvement with the Saanich Fall Fair is equally estimable. He served as board member and president; he judged fruit, vegetable and/or flower entries; and he put in untold hours as a general labourer and go-getter. He also played a major role in the fair’s 1992 move to its current site on Stelly’s Cross Road. The Peninsula Garden Club, the Sooke Garden Club, and the Sooke Fall Fair were also long-term beneficiaries of Bill’s desire to encourage local gardeners and gardening. He enthusiastically imparted encyclopedic knowledge of and techniques for growing fruits, vegetables, and flowers. He loved demonstrating “how easy it is” to prune a fruit tree or propagate a shrub. Gardening, he insisted, isn’t hard or complicated, it’s trial and error, and it’s fun. For 60+ years, Bill found pleasure in gardening. He became a recognized gladiolus hybridizer, a sought-after judge for flower exhibitions and fall fairs, a frequent presented at garden club meetings, and a teacher/mentor for show judges in training. He even hosted a local Sunday morning radio call-in show about gardening. Following the 2006 death of Bea, his wife of 62 years, Bill continued living proudly and independently on his own until last summer. His friends are richer for his good humour, generosity, and abiding friendship. The South Island is richer for his legacy of gardening know-how, his remarkable achievements, and his outstanding volunteerism. Thank you, Bill, for everything.